The city of Florence is filled with many beautiful piazzas. From popular squares filled with tourists from around the world, to the smaller, hidden piazzas preferred by the local Florentines - the city has a plethora from which to take your pick. 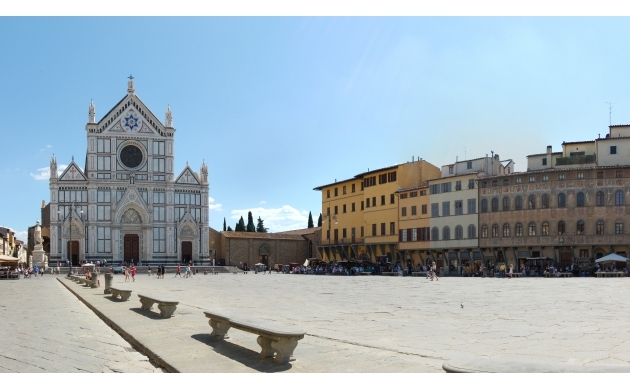 But there is one square that stands out above all the rest, and which is probably the most loved and cherished by both locals and visitors alike - Piazza Santa Croce. 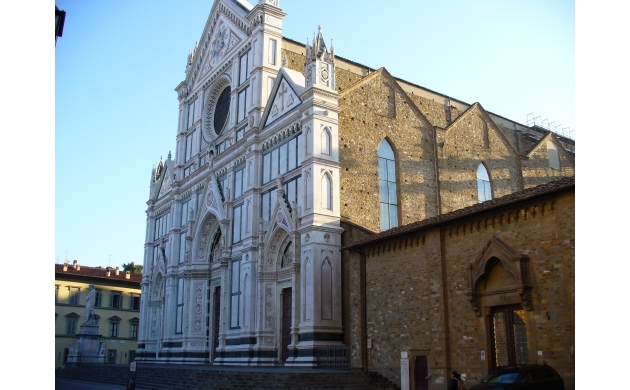 Piazza Santa Croce is one of the grandest and most famous squares of downtown Florence. Marked by the Basilica of Santa Croce, the largest Franciscan church in the world, Piazza Santa Croce is home to some of the city's most unique and beloved cultural and sporting events. 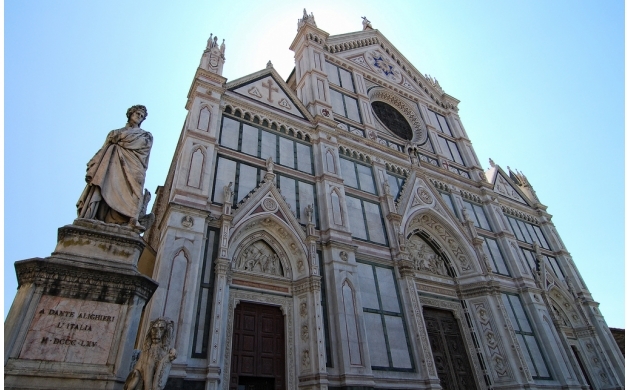 On of the most remarkable churches in all of Florence, the Basilica of Santa Croce stands watch over the piazza like a brilliant stone mosaic. Also known as the Temple of the Italian Glories (Tempio dell'Itale Glorie), the basilica is home to sixteen chapels, many of them decorated with frescoes by Giotto and his students, and is filled with tombs and cenotaphs. The church is also the burial place of such prominent Italians as Michelangelo Buonarroti, Niccolò Machiavelli, Enrico Fermi, Galileo Galilei, Guglielmo Marconi, Lorenzo Ghiberti, and many, many more. In front of the Basilica there is a famous marble statue of Dante Alighieri, where in 2006 Roberto Benigni recited the Divine Comedy beside the author's statue on the steps of the basilica. In addition to the basilica, there are a few notable palazzos located on the square. Palazzo Cocchi-Serristori, opposite the basilica, dates to the 15th century and was designed by the personal architect of Lorenzo il Magnifico, Giuliano da Sangallo, and currently houses the headquarters of the First Quarter neighborhood of Florence. Located on the south side of the square, the Palazzo dell'Antella (or Antellesi), is a rather interesting building with frescos by Giovanni da San Giovanni decorating its facade. It also has a unique feature with its windows of odd sizes, designed to take advantage of a visual trick where the different sized windows appear to be the same size when viewed from the church steps. Pizza Santa Croce, with its spacious rectangular shape, makes it an ideal spot to host events, from the particular and famous game of Calcio Fiorentino (played every spring between the teams of the four "neighborhoods" of Florence) to the German Christmas Market held every year in December. There is also the newer, but incredibly tasty, chocolate festival, as well as many other events and exhibitions throughout the year. The Piazza also hosts the Florence Marathon held in the fall and the half-marathon in the spring. Whether you come to enjoy the lovely architecture, the historic palazzi, the beauty and grandeur of the Basilica, or to have a glass of tuscan wine and enjoy the people watching on the square, the Piazza of Santa Croce will surely be one of the highlights of any trip to Florence. Take your time, stroll around, have a snack, a meal, or just a bottle of wine and watch the square fill up with locals and tourists alike - all there to share in the magic of one of Europe's most beautiful and remarkable public spaces.